Back in July I wrote a post called You are Foolish if you run Google Adwords but not Bing Ads that outlined the economic theory explaining how Bing Ads return a higher ROI although lower volume than Google Adwords. I’ve been running PPC campaigns on both platforms for Atticus’ clients and have confirmed the theory. Interestingly, depending on the market forces, Bing is dramatically more effective at delivering not only more cost effective traffic, but more traffic overall. What follows is comparative data for Adwords and Bing Ads for one client in a particularly interesting market. While this is an extreme example, consider it an example of Bing delivering vastly better ROI. This is a fairly simple campaign – with four different Ad Groups representing four different practice areas. I copied the campaigns verbatim from Adwords into Bing (thanks for the nifty import tool Microsoft). The only difference is in geotargeting, which I had to manually adjust for the Bing campaign, as they offer much less granularity (read: worse) than Adwords. So this is NOT a pure apples to apples comparison as the Bing geo is admittedly larger, but as close as I could make it. Now the volume difference was a surprise – and perhaps partially explained away by the larger geo area covered by Bing Ads, although I suspect there are competitive forces at play there as well that are driving the performance. The real kicker is the cost per click for Adwords running 150% higher than that for Bing Ads. And this is the figure that drives ROI. So let me say it again: You are foolish if you run Google Adwords, but not Bing Ads. Insightful as always Conrad. Do you know if anyone has dug deeper to determine if there is a difference in conversion between Adword clicks and others. Who is not searching on Google these days? People who don’t switch from the default on their window based computers? Seth – interesting questions. I’m sure there is a modicum of difference in the overall profile of a Bing vs. a Google user. (Like people who haven’t changed their factory settings for example.) Having said that – I can’t imagine the difference is that large – and more importantly – there is no way the demographic differences outstrip the massive gulf in ROI. I have a question about this: What was the budget differential? Did you have a budget cap that impacted how often your AdWords were displayed? Budget was exact same – the only difference (and it wasn’t a small difference) – was the inability to geotarget at a much more granular level. In all fairness – it is possible that this accounts for the difference in volume of clicks, but not the difference in the drastically lower cost per click. Conrad, my experience has essentially been the same. 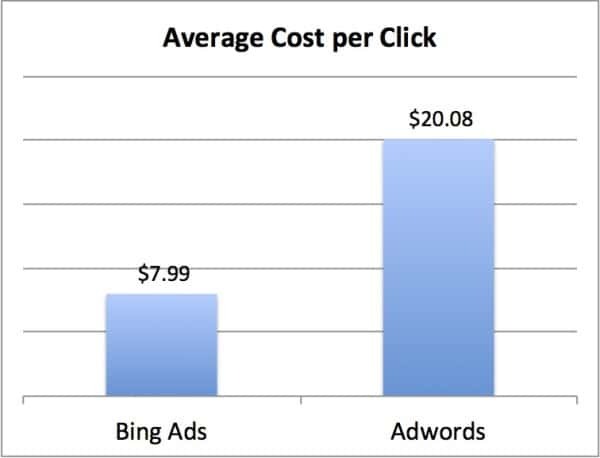 The cost per click is way less with Bing. 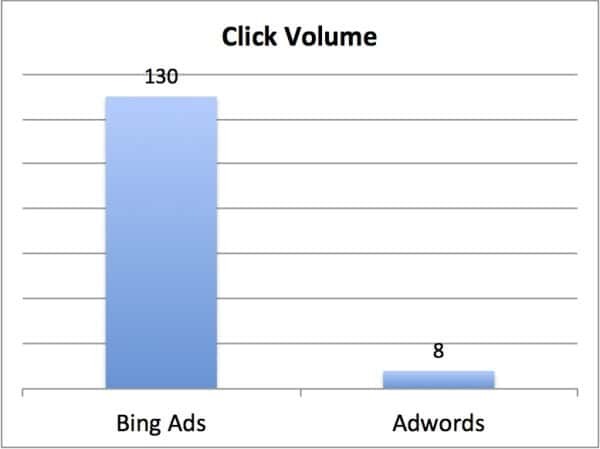 The pure number of clicks is less on Bing than Google. But, in the end, I don’t care about clicks. I care about number of clients retained and the amount of revenue/total cost. In the revenue/cost metric, Bing performs better. I wonder how sitelinks are working with Bing over Adwords. I have noticed lower conversion rates with Bing, regardless of the vertical. The fact that Google has made control over mobile spend more limited may drive smart or disaffected advertisers to away to Bing.